The 4th annual Grassroots music festival in Key Biscayne overcome every obstacle that came it's way. Thursday night was the coldest night of the year in Miami, a record low thirty-eight degrees, mixed with a naughty wind whipping off the bay from the north. Still, a respectable 1,000 heads (approximately) came out, set-up tents and kept the faith. The outdoor stage was more difficult to navigate for both performer and audience member, but this was balanced by the warm and intimate dance tent that rocked the night. The producers and crew of the festival are obviously consummate professionals and no shows or performers were canceled, no tents fell, no equipment was damaged. Friday night the city of Key Biscayne decided to set-up a DUI checkpoint, a potential obstacle that did not deter the festivities. (Come on, Officers--was that honestly really necessary?) Again, the weather sucked --the wind wanted to play naughty, cuddling the cold, kicking up the dirt like Pigpen -- it kept getting in people's eyes --but the scene was definitely awesome. Not incredibly crowded but definitely a cool Moksha hippie Burning Man vibe mixed w a little New Orleans Zydeco, funk and folk. Definitely an older crowd but absolutely positive, no punks or whiners, not even the kids acted up (and there were many at this family friendly event). 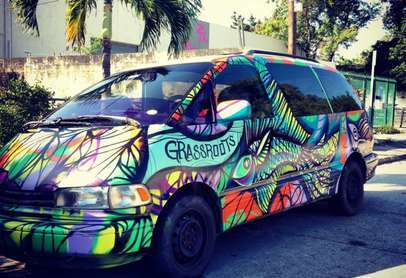 Grassroots Miami is a spin-off of a music festival called Grassroots that has occurred in upstate NY for the last 25 years. The same producers also throw their grassroots festival in North Carolina and now for 4 years in Miami. So the crowd at Grassroots Miami is pretty split: there's a huge contingent of loyal grassroots heads from upstate and central New York who make the pilgrimage out of February misery, mixed with some North Carolina peeps and of course our steady Latin-infused counterculture. Grassroots Miami is an incredibly good vibe. I felt at home the whole time. That's family! That's a music fest. And they included EVERYONE that constitutes Miami's music and counterculture: Afrobeta, Suenalo, Lanzallamas, Locos Por Juanas, Spam All Stars, Nag Champions, Elastic Bond, Telekinetic Walrus -- mixed in with art collectives like Moksha, Yo Miami, and Life Is Art -- peppered with local healing arts organizations -- plus the venue (Virginia Key) is simply spellbinding. Grassroots Miami is THEE most mellow, positive gathering / festival you could possibly imagine -- and in complete juxtaposition to the hustle and flow and swagger of our Magic City. Grassroots Miami is the EXACT opposite of the Ultra Music Festival and no promoters were killed in the process. The logical evolution of Grassroots Miami is to answer the following question: how do you grow it? 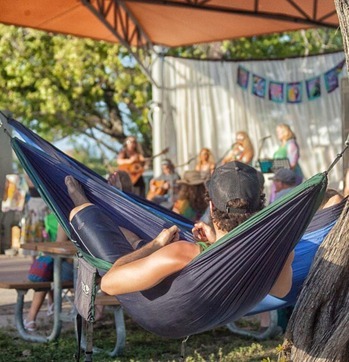 In a perfect Miami utopia of music festival culture, the producers of Grassroots Miami would continue to consult with the minds behind Moksha as well as the local jamtronica promoters Massive Ideas and also the promoters of the Downtown indie-pop venue Grand Central. These Miami forces could throw a successful camp out music festival at Virginia Key, sort of like a Bonnaroo in Miami. They could do it. I see it so clearly! Right now, Grassroots Miami needs bigger acts. They need to bring out more Miamians. They have the vibe and production quality --and they might be happy with the way things are -- but a brother can't help but to dream! Either way, Grassroots Miami is one of the best events in our city and we can only hope and continue to support this festival so it stays in Miami for many years.